Do you sometimes feel bad when the milk splits but not completely? If it splits completely, you can make various things out of it, but if it doesn't, then we fret over how so much milk has to go waste. Bring milk to boil. 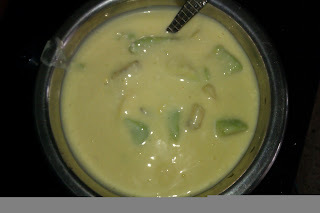 Take 3 tbsp of milk from the boiled milk and cool it down a bit to add custard powder. Make a fine paste and keeping milk on low flame, add custard paste, stirring continuously so that no lumps are formed. Turn off flame once desired consistency is achieved. Add sugar and mix well to dissolve it. Just before serving, add fruits. If you like it chilled, then you should refrigerate it after adding fruits. Custard luks delish and Yum Yum..Luv it! Lovely idea to make use of spoilt milk..:) Should try this out..